Backpacking First Aid Kit - What needs to go in them? OK, so it is time to plan for your back packing trip. What do you need to pack in a Backpacking First Aid Kit? It can be easy to overlook packing a decent first aid kit but don't let limited space fool you. Taking a First Aid Kit is a must as you can't always find a doctor when you are travelling, so be prepared for emergencies and put together a kit by answering the below questions and checking out our backpacking first aid kit checklist. 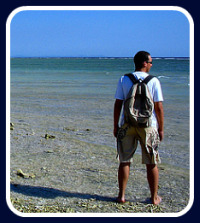 Are you going backpacking in a foreign country, the desert, a coastal region or rugged terrain? Research and get to know what the individual "dangers" are in the area you will be going to e.g. types of native animals like snakes, ticks or disease carrying insects also there maybe poisonous plants that you might encounter. Depending on where you are going will influence what you need in your backpacking first aid kit. Who is going on the trip and what do they need in the kit? Maybe it will be just you or maybe there are others going as well. You need to take into account the number of people that will be on the trip, as well as whether there will be adults and children as they require different medications and doses. Be familiar with any of their special medical needs like allergies to bee-stings. An epi-pen will need to be carried and more than one person needs to know how to use it. How long will you be backpacking for? The length of the trip will influence the amount of stuff you will need in a backpacking first aid kit. When you are putting together the best first aid kit for your trip you need to take into account all of these factors. They will influence the contents and size of the kit so customise the backpacking first aid kit for your trips specific needs. The below checklist seems long but it is surprising how compact you can pack the contents with some creativity. A good compact Backpackers First Aid book. Antiseptic - like Betadine individually wrapped swabs as you can either wipe a wound over or squeeze the swab so droplets can be applied to a wound and they take up such little space. Burn gel with Aloe Vera is our preference. Aloe Vera aids in healing, pain relief, has anti-inflammatory properties, helps prevent blistering and scarring. Stings and Bites cream - I prefer one with a local anaesthetic especially for kids and secretly for myself. My son scratches his bites when he is asleep and ends up with bleeding and weeping sores so reducing the itchiness of bites before he goes to sleep helps to keep the sheets blood free. Electrolyte replacement powder or dissoluble tablets - for when you are walking in humid temperatures and sweating out your bodies salts and minerals. Or if you suffer from vomiting and diarrhoea. Antiseptic wipes or gel - for cleaning your hands before touching open wounds. Band Aids - a variety of shapes and sizes for cuts and scrapes. We find the long strips of fabric tape with the padding already in place is great because you can cut it to any length then seal it down with adhesive tape if needed. Adhesive Tape - I prefer paper tape as you do not have to have scissors to cut it as it will tear by just using your fingers - Get a good quality tape that will not get brittle with age or lose it's stickiness. It is useless when that occurs. I have also used adhesive paper tape for the same purpose if steri-strips are not available as it is clean when it comes off the roll. Do not place your fingers on the sticky side where it will be covering the cut. Safety Pins - We use tape to do most of the jobs that safety pins do although tape fails if your pants zipper breaks, tape just does not hold it together. Safety pins win here. So a good idea to pack a few. Snake bite kit - This is only necessary if the location to which you are going to has venomous snakes. There are different schools of thought about snake kit contents. So check out where you are going and what snakes are present there. If you take one know how to use it. Also check out our Snake Bite pages. Sunscreen - prevention of sunburn and long term skin damage. Clip-lock bags - I like these as they come in different sizes and take up such little room in your pack. They can be used for carrying so many things from wet swimmers to a few band aids in the outside pocket of your backpack. Then you can grab them easily when you need them. Mobile phone - charged. You will also need to check whether service will be available in the area you are going to be in. When an accident or injury occurs you may not have much time to read a manual while trying to give first aid to an injured person. We at FirstAidanywhere.com recommend you do a First Aid Training Course to learn what first aid challenges you may encounter and how to treat them. The course you choose should include performing CPR, First Aid for Cuts and Scrapes, how to stop bleeding, how to stabilise a fractured limb, as well as how to treat burns, snake, spider, and insect bites as well as how to treat other injuries. One more thing to take with you is a good attitude towards the ups and downs of what you will look back on as a great travelling experience. Hope you enjoy it.